When it comes to my creative interests, I enjoy variety as opposed to static consistency. Musically, I enjoy listening to everything from Billy Joel and Benny Goodman to Slipknot and Slayer. Aside from keeping my listening selections fresh and diverse, the broad array of bands I enjoy serve also to influence my guitar/piano playing and music writing in general. The same situation applies to my writing as well. It is said that in order to be a great writer one must also be a voracious reader. I'm far from the former but undeniably one of the latter. My obvious literary influences include the likes of R.L. Stine, Stephen King, and H.P. Lovecraft but there are far more writers who have helped to shape my fiction writing that couldn't be further from my preferred genres. Irish heavyweights like Yeats and Keats, Oscar Wilde and James Joyce have had arguably more impact on my writing style and the way that I approach literature in general. With that said, I take a far different approach to constructing my prose. I seek to create melodic passages in my descriptive runs, opting for the word that sounds the best phonetically rather than either the simplest or the most impressive. Stylistically, I try to eschew typical writing conventions at times in favor of an approach that I believe will produce the greatest visual image in my readers' minds. Television shows like LOST, Fringe, Breaking Bad, and The Walking Dead all employed storytelling techniques that, in turn, have appeared in my own writing. 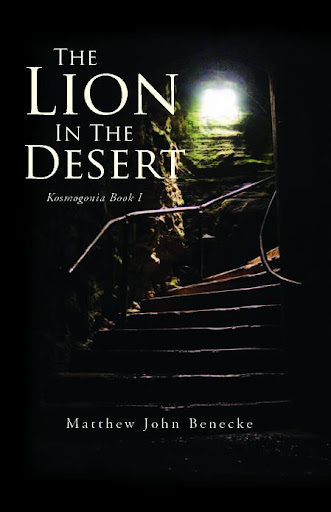 In The Lion in the Desert, for example, I make use of flashbacks, varied time shifts, and occasionally parallel narrative exchanges. Though the story is driven by Tim Channing's experience via third person narration, to pursue an entire novel's worth of that would be boring and unfulfilling. In order to keep the flow fresh and forward-moving, I employed perspective changes at three key points in the novel. Each of these featured a new face to follow and furthered the background plot slowly bringing it to the forefront where it ultimately joins Tim's personal narrative. The first of these sections is where I drew the title of the novel from; it is also what inspired the book cover. When I saw that particular picture after completing my first draft of the novel, I immediately saw the long corridor traversed by the two mysterious figures. In my mind's eye, I looked beyond them as they approached the security door, moving towards the other end of the seemingly interminable passage, ultimately reaching the steps in the photo. I felt like the picture was at once unsettling and foreboding but also mysterious and intriguing. It made me, at least, wonder what lie beyond the stairs at the top but also question what they ultimately led down into. Of course, I found my answer immediately but for the potential reader, I hoped it would make them wonder enough to want to find out for themselves.